The Ruddington Framework Knitters Museum [photo courtesy of Ruddington Framework Knitters Museum]. The Ruddington Framework Knitters Museum is a"unique complex of listed frameshops, cottages and outbuildings arranged around a garden courtyard, together with a former chapel in which many of the knitters worshipped. The site has been restored to show the living and working conditions of the framework knitters who occupied it throughout the nineteenth century". The Folk Museum "was created from a four-roomed derelict cottage which somehow escaped demolition when many of Calverton's vernacular buildings were sadly bulldozed. In it we have endeavoured to create the atmosphere of the days when a stocking frame was the lifeline of a man and his family." 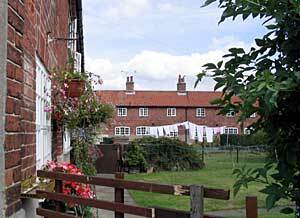 The Windles Square cottages, Calverton. The Windles Square cottages were built in 1834 and named after its builder Windles Smith. Unlike most other Stockingers cottages they have the large windows on the ground floor, for the advantage of maximum sunlight. Originally it was a complex of three rows but is now just the two, the other was demolished in the 1960's." One shop is on Wysall Lane behind the middle house of the first three on the right hand side going towards Wysall. The Pikes built the houses and owned the workshop. The second is on Nottingham Road behind number 69. 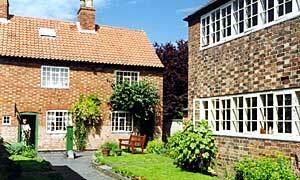 It served the six cottages owned by the Keyworth Friendly Society.